There are two major kinds of lung cancer, non-small cell lung cancer (NSCLC) and little cell lung cancer (SCLC). Staging lung cancer is based upon whether the cancer is local or has actually spread out from the lungs to the lymph nodes or other organs. Since the lungs are large, tumors can grow in them for a very long time prior to they are discovered. Even when symptoms — such as coughing and tiredness– do take place, individuals think they are due to other causes. For this factor, early-stage lung cancer (phases I and II) is hard to spot. Huge cell carcinoma, which accounts for about 10 percent of NSCLC growths. Stage I: The cancer is located only in the lungs and has actually not infected any lymph nodes. If the cancer has spread only to lymph nodes on the exact same side of the chest where the cancer began, it is called stage IIIA. If the cancer has actually spread to the lymph nodes on the opposite side of the chest, or above the collar bone, it is called stage IIIB. Stage IV: This is the most sophisticated stage of lung cancer, and is also described as sophisticated disease. 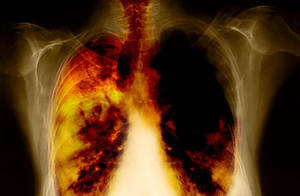 This is when the cancer has actually infected both lungs, to fluid in the area around the lungs, or to another part of the body, such as the liver or other organs. Little cell lung cancer represent the remaining 15 percent of lung cancers in the United States. They tend to grow more quickly than NSCLC growths. Typically, SCLC is more responsive to chemotherapy than NSCLC. Limited stage: In this stage, cancer is found on one side of the chest, involving simply one part of the lung and nearby lymph nodes. Extensive stage: In this stage, cancer has infected other regions of the chest or other parts of the body. The American Joint Commission on Cancer carried out a more detailed staging system where the stages of little cell lung cancer are explained putting Roman numerals and letters (for example, Stage IIA). This is the very same technique that is put for non-small cell lung cancer in explaining the growth and spread of the cancer. Survival rates inform you what portion of people with the same type and stage of cancer are still alive a particular amount of time (typically 5 years) after they were identified. These numbers can’t tell you for how long you will live, but they might help provide you a better understanding about how most likely it is that your treatment will be successful. Some individuals will wish to know the survival rates for their cancer type and stage, and some individuals won’t. If you don’t wish to know, you do not have to. Statistics on the outlook for a specific type and stage of cancer are often given as 5-year survival rates, but many people live longer– frequently a lot longer– than 5 years. The 5-year survival rate is the percentage of people who live a minimum of 5 years after being identified with cancer. For instance, a 5-year survival rate of 80 % implies that an estimated 80 out of 100 individuals who have that cancer are still alive 5 years after being detected. Bear in mind, however, that many of these people live much longer than 5 years after medical diagnosis. But keep in mind, the 5-year survival rates are quotes– your outlook can differ based on a number of factors particular to you. The numbers below are amongst the most present available. However to get 5-year survival rates, physicians need to take a look at people who were treated a minimum of 5 years back. As treatments are improving in time, individuals who are now being detected with non-small cell lung cancer (NSCLC) may have a better outlook than these data reveal. These statistics are based upon the stage of the cancer when it was first identified. They do not apply to cancers that later returned or spread, for instance. The outlook for people with NSCLC varies by the stage (level) of the cancer– in basic, the survival rates are greater for individuals with earlier stage cancers. However numerous other elements can influence a person’s outlook, such as the subtype of NSCLC, gene modifications in the cancer cells, the individual’s age and overall health, and how well the cancer responds to treatment. The outlook for each person is particular to his or her conditions. Your doctor can inform you how these numbers may use to you, as he or she is familiar with your specific situation. The numbers listed below are determined from the National Cancer Institute’s SEER database, based upon individuals who were diagnosed with NSCLC in between 1998 and 2000. Although they are based on people detected several years ago, they are the most current rates released for the present AJCC staging system. These survival rates include individuals who die from causes aside from cancer. The 5-year survival rate for individuals with stage IA NSCLC has to do with 49 %. For people with stage IB NSCLC, the 5-year survival rate is about 45 %. For stage IIA cancer, the 5-year survival rate has to do with 30 %. For stage IIB cancer, the survival rate is about 31 %. The 5-year survival rate for stage IIIA NSCLC has to do with 14 %. For stage IIIB cancers the survival rate is about 5 %. NSCLC that has actually spread to other parts of the body is typically hard to treat. Metastatic, or stage IV NSCLC, has a 5-year survival rate of about 1 %. Still, there are frequently numerous treatment alternatives offered for individuals with this stage of cancer. Keep in mind, these survival rates are just estimates– they can’t predict what will happen to any specific person. We comprehend that these data can be confusing and may lead you to have more questions. Talk to your doctor to better understand your specific situation.